Aventis Systems carries Aventis Certified Reconditioned HP BLc7000 BL460c G9 Server Blades servers. We carry a wide selection of HP blade servers, including the HP bad chassis 7000 and the HP Gen9 blade server. All servers from Aventis System include a 3-year Comprehensive Warranty, with eligibility for optional Express warranties and onsite services. We offer rush build and expedited shipping, so you can get the perfect server when you need it. HP Proliant servers are known for their unbeatable quality, reliability, and manageability. 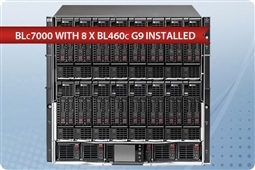 These flexible and powerful servers are the #1 choice for businesses large and small. Aventis Systems is committed to helping you get exactly the server you need. Our experienced and professional systems team will build a custom configuration suited to your business that can include optimized specifications for backup servers, virtualization hosts, or varied applications such as SQL, Exchange, or heavy remote desktop deployments. Already have a c7000 or c3000 chassis and interested in adding additional blade servers? Please browse our selection of individual HP ProLiant server blades here! Not sure where to start? Our knowledgeable sales and technical support teams are happy to help. Please use our Live Chat Live Chat or call us at 1.855.AVENTIS (283.6847) during regular business hours, or email us at Sales@AventisSystems.com.